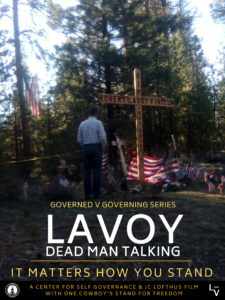 PART II: LaVoy – Dead Man Talking is the 4 episode docu-series about LaVoy Finicum; the rancher killed, by Oregon State and Federal Law enforcement on January 26, 2016. In Episode 1, LaVoy explains to you, in his own words, why he stood up to what he felt was a ‘government bully’ and describes, in detail, each and every decision he makes along the way. All proceeds will be shared equally between Jeanette Finicum and Center for Self Governance. Jeanette will use the proceeds for her ‘wrongful death’ legal fund and CSG will use the proceeds to advance applied civics across the country. Download the Documentary Showing Flier.